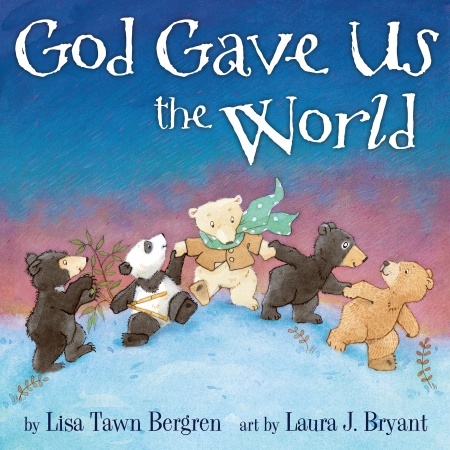 I just finished reading God Gave Us The World by Lisa Tawn Bergren. It's part of a series of books that you may have already read. Some of the other titles include God Gave Us You, God Gave Us Heaven, and God Gave Us Love. In God Gave Us The World, Mama polar Bear and Little Cub take a trip to a museum to see an exhibit of "Bears Around The World". This brings up a lot of questions from Little Cub who is surprised to learn that there are bears in other parts of the world who are very different from her. Her mama explains why they are different and how God made each bear perfectly for the places they live. Little Cub learns that even though there are many types of bears who live differently, that we all have a special place in God's creation. It helps children learn about diversity, getting along with others who are different, and how wonderful it is to be different. Hunter really loved this book. He enjoyed that there were mama bears and baby bears. He loves seeing families in pictures. I hope through me reading this story to him he will learn to appreciate the differences in him and others and that we're all special to God. God Gave Us The World can be purchased for $10.99 from RandomHouse. You can also like Waterbrook Press on Facebook here. I received God Gave us The World in exchange for a review from Random House in Association with Mama Bzz. Now that sounds like a sweet little book. Thanks!